Wonderful Wagon: Birthday Parties. Do I Really Have To? 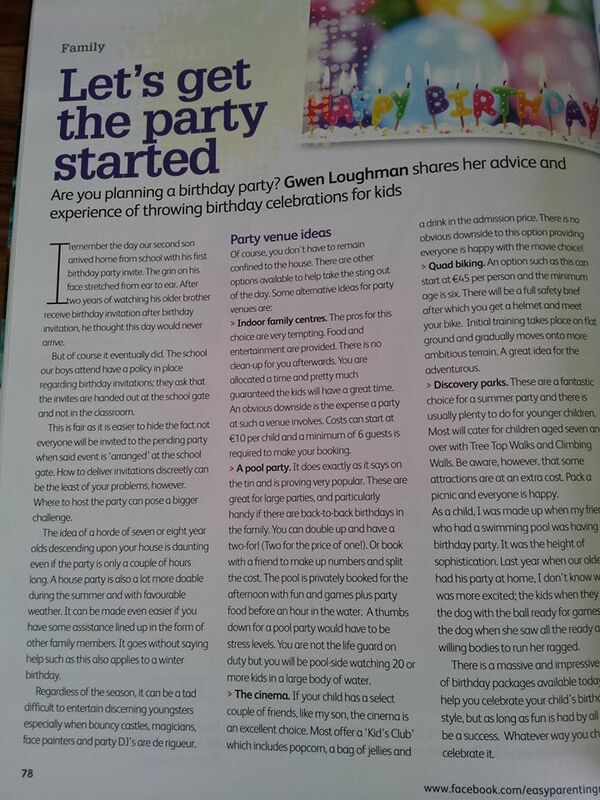 A couple of years ago I wrote a piece for Easy Parenting magazine covering birthdays and the dilemma many parents face; do I really have to and where will I host it? Sssshhh don’t tell anyone but I cannot stand by the convictions of what I wrote. There are four boys in our house and taking them plus 15 friends to an indoor family play centre would fleece me starting with €10 per child. I also mentioned quad biking which can set you back €45 per guest. 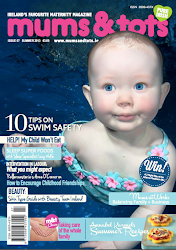 The other venue and the one that appealed to me most was a pool party at your local leisure centre. With two birthdays in our house falling on January and February a joint gathering could solve a lot of my problems. On one hand there is fun guaranteed with no mess for me to clean up afterwards but I would also be that parent pool side watching 20 or more kids in a large body of water. High blood pressure anyone? 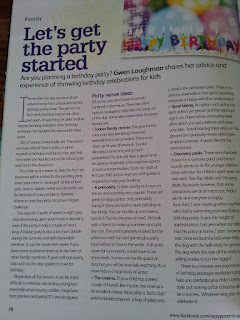 So I am going to continue to go with the option that would not have gotten me magazine inches at all: a birthday party in your own home. Where the kids entertain themselves. That’s right. No magician. No DJ. No bouncy castle. No treasure hunts. Just dozens of kids with the freedom of our castle. I gather them all together before things get too crazy and issue three rules: No teasing the dog. No-one is allowed upstairs. And have fun! Then I man the ovens and Mister Husband keeps an eye on the chaos and chases down a random child with an iron bar running around the back garden. It has happened. It’s fun really. It is. The first year was a real learning experience. Everyone arrived within ten minutes of each other. Cars pulled up all over the place, doors opened, kids piled out and ran round the back of the house. Parents were checking the pick-up time with me, heads stuck out of car windows, waving madly hardly waiting to hear the time and they were gone in a puff of un-tarmacked driveway dust. Three loud, busy, messy, fun filled hours later all the parents arrived to collect their offspring within ten minutes of each other. That same year we thought everyone was gone home and Mister Husband asked me who the boy was on the computer in the play room. Thankfully I have come to know our sons’ friends, and their parent’s, over the last number of years but birthday parties can be crazy to put it mildly. When you have 18 children arriving at your house in February you will have your work cut out for you if the weather is crap. We live in Ireland. The chances are high. But I can report, somewhat smugly, we have been blessed with good weather four years in a row on 19th February or whichever Saturday falls closest to that date. One year there was even a smattering of snow. Huge, massive brownie points. Whatever way you choose to celebrate your child’s birthday, remember you are creating great memories for them. If I can add one more final thing. It’s about party bags. In my house it won’t matter if they got helicopter rides or a jaunt on a camel, if there is no party bag forthcoming this is the thing that can make or break the party. These bags of sugar are a very contentious issue and if you do hand them out, it’s even more upsetting for the sibling of the party guest who shows up at your door looking for one. Because let's face it, that's the only reason they got out of the car in the first place. So maybe fill a few extra to be on the safe side. 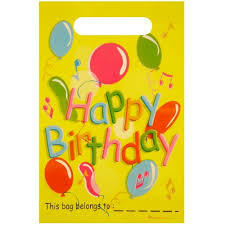 The way I see it is, party bags are a fantastic way to rid your house of left over party treats. You don’t have to include party favours. A few rice krispie buns, a jelly or two, packet of crisps and a bit of birthday cake. They’ll love you for it. And believe me, so will the parent. P.S. Keep a bottle of plonk in the fridge for motivation. Open the door at regular intervals and look at it. I said look at it. This will keep you going. Do this as many times as is necessary.